The Text Video Display is complete! I've discovered a simple microcontroller and have taken a new approach to create a 40x25 monochrome text display. I am using an Atmel ATMega8 controller which contains 1k of SRAM and 8K of Flash ROM. I store the character data in the SRAM and the font is stored along with the program in the Flash ROM. The interface is an 8 bit parallel port with a strobe input and a busy output. It can be connected directly to a 65C22 8 bit port or any generic parallel port with ease. While testing with the earlier circuits, I kept having problems with jitter while writing data from the host. I finally decided to drop the 74ACT715 and find a microcontroller that could handle the task. I tried a PIC 16F628, but it just didn't have the horsepower or enough onboard RAM to simplify the circuit. The Atmel ATMega8 was perfect. It had just enough I/O and onboard memory to handle the task. Here is a sample of the display. It includes all of the characters programmed into the font data table. Here is a copy of the character sets that I chose. Lower = the lower 128 characters with the supported control characters (see description below). Upper = the upper 128 characters including the box drawing characters in Primary mode, inverse characters in Alternate mode. 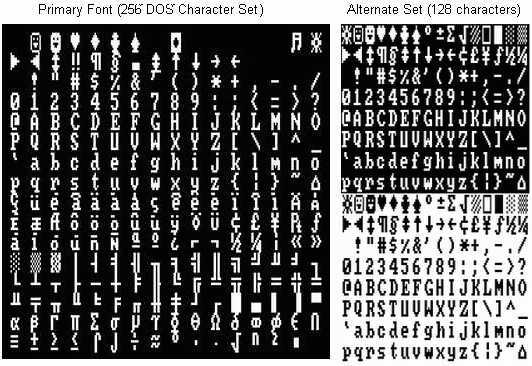 Primary Font Select = Enable the 256 DOS character set. Alternate Font Select = Enable a subset of 128 characters with Inverse video support. See the Command Bytes below for the specific toggle commands. The Host polls the Busy line and waits for it to go inactive (J4 selects active high or active low), then loads the data onto the data bus and clocks the strobe high. The Busy line will go active and stay active until the data has been processed. The time it takes to process a data byte depends upon several factors, including display refresh operations and display movements such as scrolling. Here's the schematic. As you can see, its a very simple circuit. The 74HC573 Octal Latch is not necessary as long as you leave the data inputs stable until the Busy Flag is reset, but I decided to add it to make the circuit more versatile. The 74HC74 D Flip-flop acts as the strobe latch and Busy Flag, which ensures the host's strobes are not missed by the ATMega8 during screen refresh. It also divides the system 16MHz clock down to the 8MHz needed for the shift register. The 74HC165 shift register takes the parallel font data and shifts it out to the analog section to produce the video display. All timing and control is provided by the ATMega8's program running at 16 MHz. J3 is left open for NTSC, and shorted for PAL. J4 selects the Busy Output logic level, short pins 1-2 for Active High or pins 2-3 for active low. When interfacing to a 65C22, use active low and the 74HC573 is not needed if you use the program provided below to access the display. Here is the SBC-2 driver used to reroute the Monitor's output to the Video Display. All info provided "as-is" and is Copyright 2003-2004.